Okra, this green vegetable is believed to possess lots of health benefits, and several studies have shown that okra can help treat diabetes. One study found that the seeds and peel of okra have anti-diabetic properties which led the rats to stabilized blood glucose levels—the prime concern in all diabetic animals, including humans. Another study found that okra extract had anti-diabetic effects on rabbits. Over a ten-day time span, the okra level gradually reduced blood glucose levels among the experimental group of rabbits, comparable to the reduction caused by the popular diabetes drug, Metformin. Wash 4 medium size okra pods and clip off both ends of the pods. Place the pods into a glass and cover them with clean, room-temperature water, leave it for a whole night. Give the pods a good squeeze before removing from the water. Discard the pods and gulp down the water. Note: Although rat and rabbit studies may translate well to human applications, the human evidence for okra as an anti-diabetic treatment are limited to anecdotes at this time. So make sure to consult with your doctor before taking okra to treat diabetes. It’s super low in calories and contains a number of vitamins and minerals. Okra seeds and pulp are high in the antioxidants catechin, epicatechin, procyanidin B1 and B2, quercetin and rutin that can fight the damage caused to cells by stress and other environmental factors. Okra is rich in folate, which is considered as an important natural compound for the pregnant women to help grow and maintain new cells. A study found that regular consumption of okra can help prevent kidney disease. It has been proven that those who ate okra daily can reduce the medical signs of kidney damage. Okra contains a good amount of Vitamin C, which is a crucial compound for healthy skin. It promotes growing skin and rejuvenate damaged skin. Okra is high in fiber, so it’s a good choice to add this high fiber vegetable to your diet to promote a healthy digestion. Have dandruff problem? Okra helps! Okra improves the overall scalp condition by moisturizing your scalp and keeping dandruff away. Okra contains healthy amounts of Vitamin A, which is essential for maintaining a healthy vision. 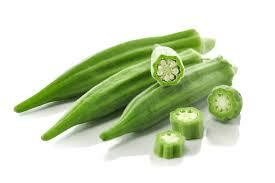 Okra helps prevent and improve constipation, this is the fiber absorbs water and ensures bulk in stools.